Before Coca Cola was introduced to Hungarian consumers in 1968, and prior to Pepsi’s 1970 debut in socialist Hungary, the young and the old alike drank and presumably enjoyed an orange soda called Bambi. Earlier today, being in Budapest, I decided to stop by one of my favourite retro-themed cafés–Ibolya Presszó, located in Ferenciek tere–and give Bambi a try, alongside some water, coffee and the morning paper, for good measure. 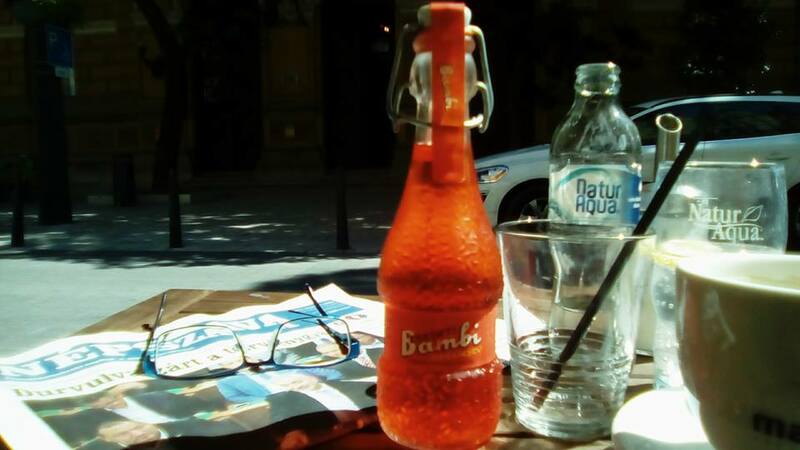 It must be nostalgia for one’s youth that drives some Hungarians to purchase the small, 250 ml bottles of Bambi–an orange soda that screams of artificial flavour, but comes in a nifty, clipped bottle. The soda itself isn’t unpleasant, it’s simply nondescript. It’s history, however, is as colourful as this region of Europe. When Coca Cola was introduced to the Hungarian consumer in 1968 and then Pepsi in 1970, Bambi faced real competition for the first time. Hungarians began to prefer Coke and Pepsi products, and the authorities tried to keep Bambi alive by ensuring that any purchase of foreign soft drinks by stores was matched by an obligatory equal purchase of Bambi. By the late seventies, however, the Bambi brand was disappearing, simply as a result of the law of supply and demand. Demand had collapsed, as new flavours and colours poured into Hungary from the West. Today, a municipal company in Budapest that operates the city’s thermal baths —Budapest Gyógyfürdői és Hévizei Zrt.-nél (BGYH) — also produces Bambi, but in very limited quantities. The drink is now only available at Ibolya Presszó and approximately 5,000 bottles are produced a year. So Bambi is a rarity…and perhaps a delicacy? Most people who still opt for this at the Ibolya are well over seventy…which is probably why the waiter raised a bemused eyebrow when I placed my order. Sometimes a small ethereal product defines a period in history that manages to hold on through the years. Just like Proust’s Madeleine moments they instantly transport us – most often- to when we felt secure and carefree. I shall certainly seek out ‘Bambi’ on my next visit and present it to my partner and watch her reaction! For me I am transported most day’s at breakfast by a product that is still sold and which transports people back in time – similar to your nostalgia over Bambi. My grandmother first introduced me to it on ‘soldiers’ – which were cut up pieces of toast you could dip into a boiled egg! Marmite is made from the yeast waste products from the beer-brewing industry so it makes you wonder how it has lasted so long. During the two wars the advertising of the product was legendary and to many people here it really cements the nostalgia every time it is spread on those ‘soldiers’! And btw! We often present Marmite to Hungarians as an example of British food – and they ALL hate it! My partner says it is an ‘aquired’ taste and really likes it on toast (now!). But every other Hungarian who has tried it ends up putting it in soup to get rid of it! Another product we often take with us to Hungary is real English ‘Marmalade’. To the English there is only one preparation that can be called marmalade – the orange preserve can only be made from those bitter ‘Seville’ oranges, which you wouldn’t look twice at on display, all discoloured and misshapen – to qualify for the name ‘Marmalade’. The Scots claim to have ‘invented’ it when it was made as a solid bar which you cut in pieces and ate. A preserve only for the wealthy. However it has now evolved into a ‘jam’ spread (Don’t EVER call it Jam!) which my partner assures me is another ‘aquired’ taste. Very few Hungarians like this too! I recently had to stop over in Germany and to confuse the world even more – presented a real jar of English ‘Marmalade’ to some friends. In Germany they call jam – marmalade. I felt it was my duty to apprise them that jam is not marmalade – especially as I had been offered ‘Marmalade’ which disappointedly turned out to be jam! Yes so were they! (And us!). My partner responded in a surprising way! She says she’s never seen the drink – or too young to remember. She had to dig deep for the words – but it took her back…back…back! And she could sing the song – mostly! The open-air swimming pools (we call them ‘lidos’) in the video were all over Hungary and an important part of Kadar’s communism. A friend in Hungary took me to an open-air swimming pool recently which was deserted in the afternoon in Hungary. He told me that in the ‘old’ days the pool would be full with workers from the factories – playing hooky from the workplace. There was a lot of iconography – mostly Lenin some of which was still there. 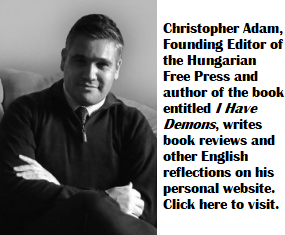 At a time when Kadar’s communism was characterised by the worker’s pretending to work – because the government pretended to pay them! Listen to this video – it’s fascinating! The story behind this song is fascinating too – how important ‘status’ was in a system where everyone was supposed to be equal – and ‘individualism’ was discouraged. Kovács Eszti is the singer in the original song and she is interviewed here – again fascinating to a Westerner. Apparently ‘bambi’ now refers to any sweet drink – cola, squash and fruit juice – in Hungarian culture due to this beverage. The offspring of the Bambi generation aren’t even aware of the original drink – but the word has passed into the Hungarian lexicon – like ‘biro’ and ‘hoover’ have in the English lexicon!